Palestinian city on the Mediterranean, about 85 kilometers southeast of Jerusalem. In early times it was one of the terminals of the trade-route from South Arabia, as well as from Petra and Palmyra. Gaza was condemned by Amos (i. 6) for trafficking in slaves with Edom. On account of its position its possession was bitterly contested by the Pharaohs from the sixteenth to the fourteenth century, and by the Ptolemies in the third and the second. The history of Gaza goes back to remotest antiquity. It is mentioned in Gen. x. 19 as the boundary of Canaan. Conquered by the tribe of Judah (Judges i. 18, where LXX. introduces "not," probably having later conditions in mind), and retaken by the Philistines, it was the scene of Samson's prowess; he is said to have carried the two gates of the city up the neighboring mountain, and to have perished subsequently in overturning the temple of Dagon (Judges xvi.). It was accounted one of the five chief Philistine cities (Josh. xiii. 3), and at the time of Solomon was the southern limit of the kingdom (I Kings v. 4, Hebr.). When Alexander the Great went from Tyre to Egypt, he took Gaza and left a garrison there. 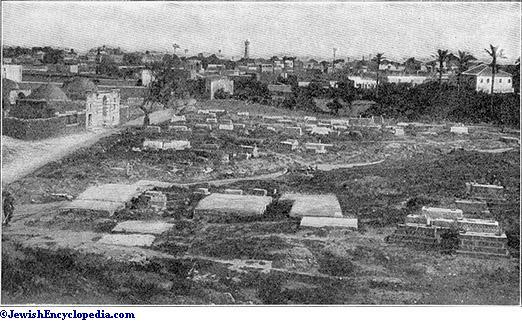 The city later capitulated to Jonathan Maccabeus, who destroyed the suburbs by fire. 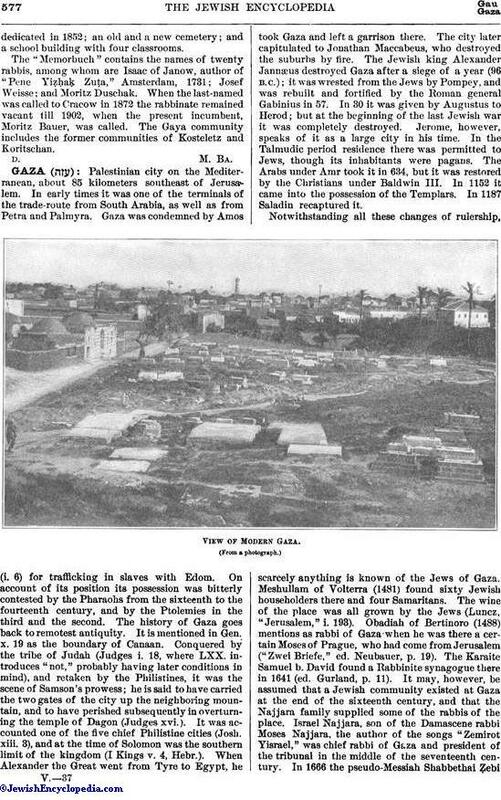 The Jewish king Alexander Jannæus destroyed Gaza after a siege of a year (96 B. C.); it was wrested from the Jews by Pompey, and was rebuilt and fortified by the Roman general Gabinius in 57. In 30 it was given by Augustus to Herod; but at the beginning of the last Jewish war it was completely destroyed. Jerome, however, speaks of it as a large city in his time. In the Talmudic period residence there was permitted to Jews, though its inhabitants were pagans. The Arabs under Amr took it in 634, but it was restored by the Christians under Baldwin III. In 1152 it came into the possession of the Templars. In 1187 Saladin recaptured it. Notwithstanding all these changes of rulership, scarcely anything is known of the Jews of Gaza. Meshullam of Volterra (1481) found sixty Jewish householders there and four Samaritans. The wine of the place was all grown by the Jews (Luncz, "Jerusalem," i. 193). 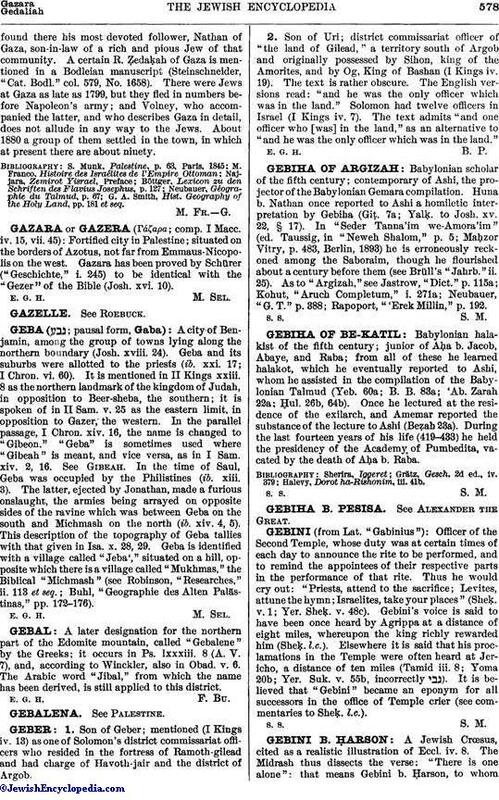 Obadiah of Bertinoro (1488) mentions as rabbi of Gaza when he was there a certain Moses of Prague, who had come from Jerusalem ("Zwei Briefe," ed. Neubauer, p. 19). The Karaite Samuel b. David found a Rabbinite synagogue there in 1641 (ed. Gurland, p. 11). It may, however, be assumed that a Jewish community existed at Gaza at the end of the sixteenth century, and that the Najjara family supplied some of the rabbis of the place. Israel Najjara, son of the Damascene rabbi Moses Najjara, the author of the songs "Zemirot Yisrael," was chief rabbi of Gaza and president of the tribunal in the middle of the seventeenth century. In 1666 the pseudo-Messiah Shabbethai Ẓebifound there his most devoted follower, Nathan of Gaza, son-in-law of a rich and pious Jew of that community. A certain R. Ẓedaḳah of Gaza is mentioned in a Bodleian manuscript (Steinschneider, "Cat. Bodl." col. 579, No. 1658). There were Jews at Gaza as late as 1799, but they fled in numbers before Napoleon's army; and Volney, who accompanied the latter, and who describes Gaza in detail, does not allude in any way to the Jews. About 1880 a group of them settled in the town, in which at present there are about ninety. G. A. Smith, Hist. Geography of the Holy Land, pp. 181 et seq.